André Eiermann has always had a fighting spirit. As a teenager, he faced fellow countryman Roger Federer in a tennis championship in their hometown of Basel. The contest was fierce, but Roger, showing his natural ability early on, won on that occasion. That same year, Roger was asked to join the Swiss Tennis Federation and moved from Basel to a training academy, while André went to study a Masters in Economics and Political Science at university. After graduation, André had short stints working with large international marketing companies, but didn’t find the right fit. He was headhunted by a green bean company, and at age 26 went to work with Volcafe, one of the world’s largest coffee importers. André got the job and was thrown into the deep end as a Junior Coffee Trader at Volcafe’s head office in Winterthur, Switzerland. Each day he would cup coffee from different origins around the world, but he still felt disconnected to the source. He wanted to work at origin. André arrived in Kenya and immediately began his immersion into African life. André spent most of his time in the cupping room, on coffee farms, and in the dry mill. He would cup between 400 to 800 cups of coffee each day in Volcafe’s labs. In Switzerland, he ‘only’ cupped between 100 to 120 cups a day. Each week, André would receive auction samples and catalogues of coffee to grade and profile. “After cupping hundreds of coffees, it all started tasting the same. My trainer Sammy would give me certain descriptors, make me taste the coffee again, and get me to repeat the descriptors. If you do this taste-by-association learning every day for eight months, your palate will become attuned to certain flavours. It’s how I learned to memorise cupping notes,” he says. André stayed in Kenya from 1999 to 2000. While he loved his work, he says the violence he witnessed became unbearable. André took a break from coffee and returned to London to study fashion photography and graphic design. After his studies he worked in the marketing department at Kraft Foods within the coffee sector. He had reignited his coffee passion. After five years, he moved to Ueshima Coffee Company (UCC Coffee), and it wasn’t long after that André put his intensive palate training to the test in his first cup taster’s competition in 2013. “I thought, ‘OK, it’s been a few years since I’ve cupped coffee, but why not? If I don’t do well, nobody will care’,” he says. He need not have worried. André won the event. It did more than create a new opportunity. It started his exploration into specialty coffee. Following his cup tasters success, André explored the suite of coffee competitions, including latte art, and the 2017 Swiss Barista Championship, which he won. André went to prepare at UCC Coffee and based himself at its Tokyo coffee academy, which supported André for five months while he trained with 2014 WBC Champion Hidenori Izaki. André trained what seemed like seven days a week, 24 hours a day, even during his sleep. Looking back, he says the intensity and pace in which he worked with Hide was “amazing, but intense”. “From June to August I experimented with espresso extractions. I extracted a couple of hundred espresso shots each day, and filled out hundreds of Excel spreadsheets with the extraction results, including details on total dissolved solids, extraction yield, cup profile, and so on. I compared the results with different grinders, temperatures, barista tools, distribution leveling tools, you name it,” André says. Hide wanted André to find an innovation for his WBC routine. After 20 declined suggestions, André sent him scientific evidence on nitrogen flushing and it was the one topic that had him “jumping around like a little boy”. That latter came when André discovered he could roast and de-gas coffee on stage. 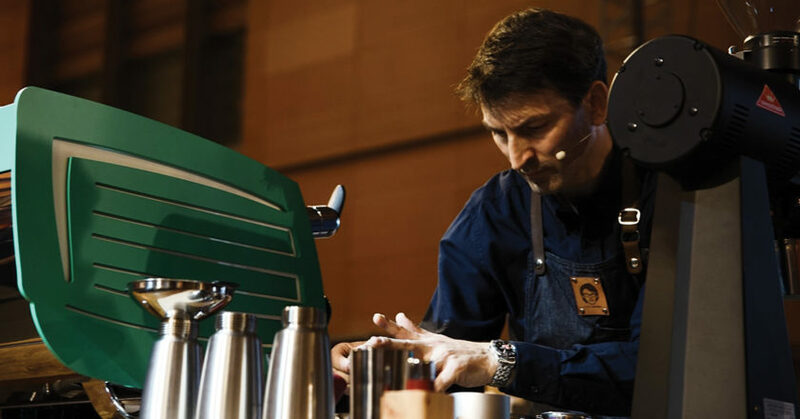 At the 2017 WBC in Seoul, André says he could hardly breathe through the first round of his performance. “I didn’t want five months of training to be for nothing, and that played through my mind,” he says. Despite thinking he’d “messed up”, the results proved otherwise. André went on to place 10th in the world, an achievement he views as a career highlight. Seoul gave André the lauchpad he needed to pursue his coffee passion, and his support base has widened as a result, including Australian cleaning agent Cafetto. 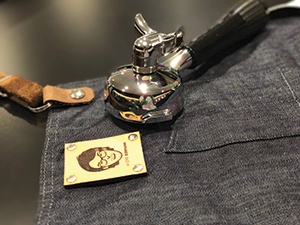 André first became acquainted at the brand’s Barista Base Camp in Seoul, which allowed competing WBC baristas to practice their routines with equipment set to competition specifications before hitting the stage. Cafetto has continued to support André, and he does in return, using its range of products at the UCC Coffee Switzerland Academy he founded. As a way to give back to the community that’s supported him, André has compiled his diary of notes, which he kept through his training experience in Japan, and will soon share that with audiences in a new book, due for release around the 2018 WBC in Amsterdam. André has no intention of competing again. A happily married man with two kids, he says he’s content in making coffee on his Nespresso machine at home, and working as a Marketing Director for UCC Coffee in Switzerland. He even finds time for the occasional hit of tennis. Fellow countryman and 20-time grand slam winner Roger Federer may have grown his portfolio of brands to includes sponsors such as Rolex, Moët & Chandon, and Mercedes-Benz, but André is also a proud ambassador for Victoria Arduino and Nuova Simonelli, and a title holder of a craft we doubt Federer will ever have: the 2017 Swiss Barista Champion and 10th best barista in the world. This article appears in the June 2018 edition of BeanScene magazine.